"Boston Light stands at the entrance of Boston Harbor, at Little Brewster Island, one of a group of rocky islands in the harbor named after the family of William Brewster (1567-1644), the ruling elder of the First Church of Plymouth Colony. 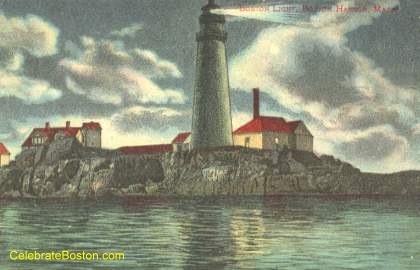 The original light station became operational in 1716, and was destroyed in 1776 by British war ships as they passed out of the harbor after the evacuation of Boston. The present light house structure was erected in 1783. It is made of stone, and stands 89 feet tall. The light house has been enlarged and refitted several times, with the current lens installed in 1859. The revolving light is visible from 16 miles at sea. The tower itself can be seen from great distances, even during the day. A heavy fog horn is also installed on Little Brewster to warn vessels in foggy weather, which often prevails in the harbor. The Boston Light tower is the 2nd oldest light house in the United States. The octagonal light house at Sandy Hook, New Jersey was built in 1764. Boston Light is still operational. The United States Coast Guard is responsible for maintaining the light station and buildings on the island.